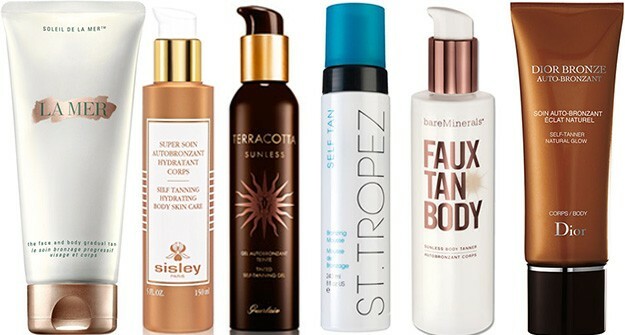 Bronzing season is almost upon us. Self-tan (no weird streaks!) with these tips. Sprays, lotions and towelettes have their merits, but for the most even application and quickest dry time, Sophie Evans, skin-finishing expert for St. Tropez, recommends a mousse like our Healthy Beauty Award winner. And where may surprise you: Experiment on your stomach. "It's an area where your skin tone is lightest, so you'll see the biggest change," Evans says. If it turns orange, you can always keep that six-pack temporarily under cover. Dead skin cells soak up DHA, the ingredient that makes skin darken, resulting in splotches of color. Do exfoliate, but here's the rub: Many scrubs contain oil, which stops tanner from absorbing evenly. "Skip product and use a loofah," says spray-tanning pro Anna Stankiewicz. Stay out of the creases. Coat trouble spots like your knees, heels and elbows with moisturizer. "The lotion will act as a barrier, preventing ugly color buildup," Evans says. In the form of an applicator mitt. The thin, hand-shaped piece of foam often comes with your self-tanner. Or get one at Tarte.com. Evans hails the tool as the key to a streak-free finish sans orange palms. She's also got a technique for a more natural bronze: "Make long, sweeping strokes so the color is deposited only on the surface layer of skin." Skimp and you're likely to miss a spot. Those fears that you'll overdo it? Unfounded. "Your color is based on whether you buy a light, medium or dark formula, not on how much you use," Evans explains. Spread tanner on legs first, then torso, arms and face. "Otherwise you cause marks from bending over," Stankiewicz says. Park yourself in front of a fan. Stand there, slowly rotating for five minutes. That's how long color takes to set, Stankiewicz says. Good to glow.